I never thought I would see the day when Cillian Murphy made a comedy. Okay, so you could count Breakfast on Pluto as a comedy, but a romantic comedy? Surely it couldn't be. 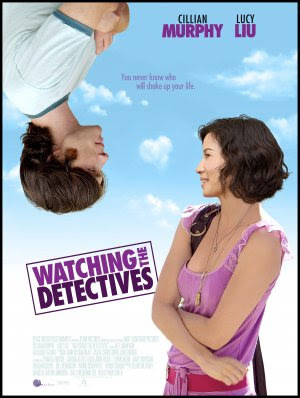 But that's how we got Watching the Detectives, a movie I found by chance on YOUTUBE. Sometimes that website can be so handy. Neil (Cillian Murphy), a self proclaimed film geek and owner of Gumshoe video, has always been content to live vicariously through his favorite films noir. But when he meets Violet (Lucy Liu), a real-life femme fatale, his mundane world gets turned upside down and the line between reality and the movies quickly begins to blur. Will Neil step up and embrace a life full of adventure or retreat back to his comfortable couch? Let me start by saying this: me and Neil are the perfect match. I could totally live with just sitting on the couch watching old movies, and it would be particularly handy if he had that video store with all the hard to find DVDs. And he is one hell of a rockstar (by the way, Cillian Murphy can sing, better than you might believe). That aside, this isn't a great movie. Sure, it may be an independent comedy headlined by two well liked stars, but it seems to go nowhere. It has a great premise too, but this seems to be a case of 'films made for film lovers that film lovers don't like'. You know, like Be Kind Rewind? That didn't exactly get the best critical rep.
Cillian powers his way through this, showing considerable comedic talent, but he has absolutely zero chemistry with his mismatched co-star Lucy Liu. The actress herself does well as Violet, considering the character is the most horrible woman one should meet, and her love for adventure is slightly scary. The script really doesn't result in much, which is a shame, because with all these films they referenced and the atmosphere it had, it could have gone places. Unfortunately, there aren't many memorable quotes. The funniest thing in the whole movie was when Cillian pulled the double fingers at the dude working at Media Giant. Mildly fun, mostly mediocre, Watching the Detectives is by no means a must see, but I am sure fans of the two leads will enjoy the watch in some way. "Watching the Detectives" inspired me to write a little piece on Lucy Liu turning 40. Whatever she does in the future as she continues to work, I hope it isn't the wacky love interest she plays here. I can't remember how this movie ended, but I seem to remember liking the last 10 minutes and feeling good about the movie because of that. Just saw Cillian in Inception. Liked him there.